WASHINGTON/SEOUL—North Korea transferred the remains of an unspecified number of soldiers killed in the Korean War, the White House said on Thursday, a first step by Pyongyang to implement an agreement made in a landmark summit in June in Singapore. 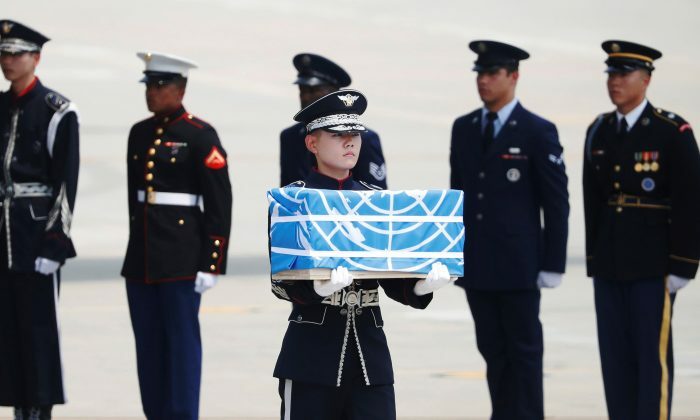 The repatriation of remains of U.S. soldiers missing in the 1950-53 conflict is seen as a modest diplomatic coup for U.S. President Donald Trump because it was one of the agreements reached during his summit with North Korean leader Kim Jong Un in Singapore on June 12. “Today, (Kim) is fulfilling part of the commitment he made to the President to return our fallen American service members. We are encouraged by North Korea’s actions and the momentum for positive change,” the White House said in a statement. A U.S. military transport plane flew to an airfield in North Korea’s northeastern city of Wonsan to bring the remains to Osan air base in South Korea, the statement said. A formal repatriation ceremony would be held at Osan on Wednesday, it said. He and everyone else knows exactly what denuclearization requires, according to the US secretary of state. The media is just being critical because the US didn’t make NK settle on a timeline. President Trump showed North Korean leader Kim Jong Un a video resembling a movie trailer in preparation for their meeting.